The following photos are from the Cherry Creek area in the Sierra Anchas, about 30 miles north of Globe. This area up to the 19th Century was completely controlled by the Apaches. It is a very rugged area and still quite isolated. It is absolutely full of legends. 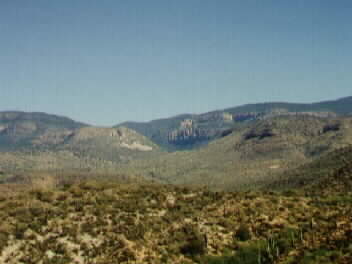 This is a view of the Sierra Anchas from the great Tonto Basin. The bottom of Tonto Basin is where Roosevelt Lake is located today. At the top of the mountain can be seen the remains of an old asbestos mine, no longer in operation. This is a long-distance view of the Sierra Anchas. 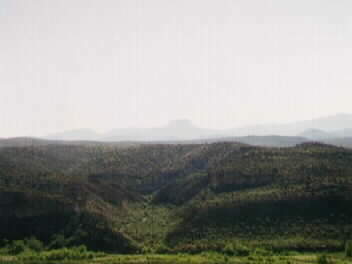 In the middle of this photograph is a long-distance view of the famous Sombrero Butte. "Doc" Thorn claimed that in the 1850s Apaches had shown him gold near this mountain that "could be picked up off the surface of the ground." In 1861 Corydon E. Cooley heard this story and in July 1869 he determined to find the gold. He led an expedition to the area but was unsuccessful. In 1871 Thomas Miner led an expedition of about 300 people into the same region, looking for another "fabulous" claim. It too was unsuccessful. Prospectors still occasionally roam this area looking for the "big one." 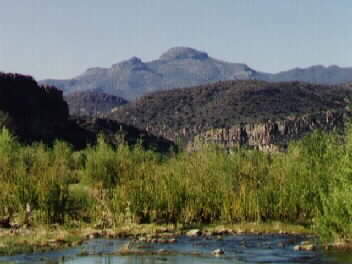 This is a long-distance view of the Apache Mountains (or Peaks) from Cherry Creek (foreground). Globe is about 20 miles south of these mountains. The Apaches called these mountains "Bich'i £ehé", meaning "fled to the hills." The mountains were a refuge from cavalry troops. 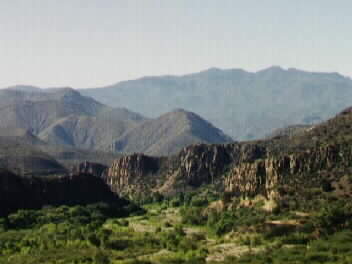 Many of the San Carlos Apaches (at least, the Pinal Apaches) claim that they originated in the Cibecue area, traveled down the eastern flank of the Sierra Anchas (Cherry Creek), and then followed Pinal Creek south from its junction at Salt River to the Pinal Mountains. If this is true, then this is the area through which they passed as they exited from the Cherry Creek region. 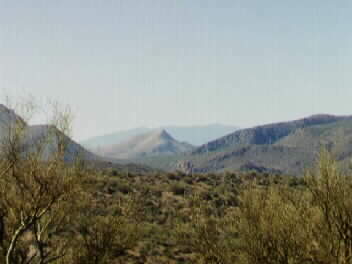 In the far distance can be seen the Pinal Mountains. 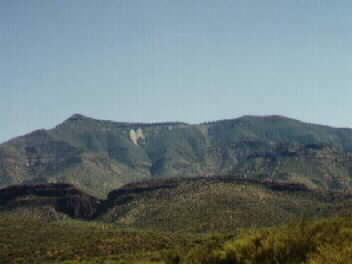 Rockinstraw Mountain was named for a rancher who first settled in this area. His last name was "Roggenstroh." In the foreground can be seen Cherry Creek.